Review of our Grumpy Burgers Teleseminar. Just read this over at a NING group. Thanks, Kath. I went on Sean's Teleseminar on Monday, and I got lots of new ideas to try, plus heaps of good marketing tips. Some things I knew of (good to get re-inforcement of that knowledge, though), but most were new ideas that will really help me improve our business and get more bookings. Sean teaches a lot of his ideas in point form (which he then elaborates on) - this is great because it makes it easy to take in and remember. I have already started to use some of the ideas, and will add more as I go along. I've only ever been on one other teleseminar, and one thing I noticed that was different about Sean's way of teaching is that he is very inclusive and approachable. He kept asking if we understood each point, and welcomed and encouraged questions from us - he seemed genuinely interested in our marketing problems, and with helping us. 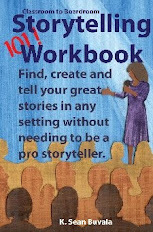 Storytelling in your organization is taking place everyday regardless of its official status as a "program." However you will find that with focused training and implementation, storytelling will raise the bottom line of any company. Before you begin adding the power of narrative to your workplace, there are a few things you need to know. For many years, I was involved in a variety of companies that jumped from one fad management idea to another. First, we were Moving Cheese. Then, we were tossing stuffed Fish around the room. And we were doing it all in just One Minute. While some of the ideas of these management romps may have been momentarily implemented at my workplaces or yours, most of these fads have moved on. Corporate Storytelling is not a fad. Everyone person who has contact with your company has a story to tell about that contact, both the good and the bad. It has been around since the beginning of time and the first moments of oral communication. It will work for your company if you are willing to think about long-term implementation of storytelling to your corporate communications. For best results, the power of story needs to be understood as a tool for all departments in your organization, not just sales and marketing. I suggest that when your company does want to invest in storytelling for their internal and external customers, they begin with a small and dedicated group of employees who are first taught the art and science of storytelling. Our "Executive Speaker Training" Workshop is a great place to get this initial training for your employees who already have basic background in public speaking. One of the people on this initial team should be a member of senior management. I have worked with companies who originally conceived the idea of storytelling in one department and then set out to find a great trainer. They assured me that the "bosses" were in line with this new program. Then, as the training sessions started, the folks with their arms crossed at the back of the room or otherwise practicing "active non-listening" were the senior management staff. You cannot expect that the average company employee will adopt a program that the leadership will not embrace. 3. You Must Integrate Storytelling, not Just Talk About It. Your new storytelling must be practiced at every business gathering, from the smallest meetings to company-wide events. Be sure that your training sessions include plenty of time for practicing storytelling instead of presentations all on theory. When you are developing this program, be sure to look for trainers and presenters who have extensive experience in actually telling stories. Does your trainer actually know how to tell (not write) stories? Did they just recently begin to add storytelling to their work or do they have a lifetime of expertise? Learning to share the company stories is financially and personally rewarding. Please take some time to learn this fundamental communication skill for your workplace. Sean Buvala is the executive director of Storyteller.net and a veteran of more than 23 years of storytelling in corporate and nonprofit settings. For more information, please consider sending your team to one of our workshops. For teams of five or more, we can come to you. If you would like to reproduce this article, please send a note to Sean at sean@storyteller.net with words "reprint permission" in the subject line. We offered our "Grumpy Burgers" Telecourse last night. The next one is Friday, 11/2. We had a great call last night and a handful of storytellers from around the world got some marketing ideas that few artists have ever used. The Economy is Not Your Business." Please consider joining us this Friday (11/21) evening? Details at: http://www.prostoryteller.com. @Storyteller great workshop tonight, Sean. Rich with on-target info for performers. Thanks. "Sean, the pleasure was all mine, I am still reeling from our conversation!!! Good stuff--Great stuff!" Come join us this Friday. http://www.prostoryteller.com. Public Speaking Workshop in Arizona with Executive Speaker Training. We have posted new dates for our premier Speaker Training Workshop! Visit us at www.executivespeakertraining.com to learn more. Dates are posted for December through March. We still have space in the December workshop if you act now. Come to Avondale, Arizona this Winter, with great temps in the 70's. Our public speaking training in Arizona is filled with less yakking on theory and more real learning and application time. Besides, it is taught by someone who really knows storytelling, not a guru that sorta added storytelling to their repertoire. Powerful two days. Come join us. We have posted pictures, interviews, blog quotes and even a transcript of and from events and people from the 2008 Mesa Storytelling Festival. Come look, listen and read more about this latest excellent event. Click this link to visit the Amphitheater now.